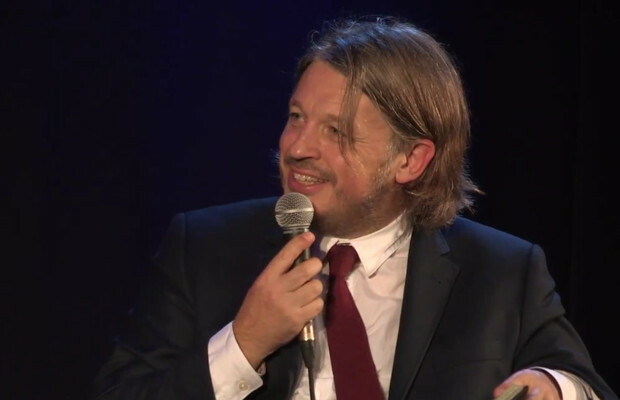 When Richard Herring shouts “RHLSTP!” to his audience at the Leicester Square Theatre, they holler it back instantaneously, and at twice the volume. It immediately becomes clear that I’ve stumbled across a society, a cult, and something that I want to be a part of. Beginning the podcast in 2012, Herring has now hosted over fifty interviews of at least an hour per episode. With a rich array of popular guests, ranging from the wave of newer, trendy comics like James Acaster, Sara Pascoe and Katherine Ryan, to the classics, including Steve Coogan and Tim Minchin, this podcast has something for everyone, be that comedy-obsessive, like me, or not. Herring is an expert. He combines his sometimes childish nature with excellent wit, sarcasm and often surrealism in a perfect balance that enables viewers and listeners to be educated as well as entertained. Both he and his guests clearly enjoy the discussions they have, and in turn, I thoroughly enjoy listening to them, and will continue to do so until there are no episodes left to hear. If you are looking for in depth insight into the comedy industry, I recommend you start with Sara Pascoe’s interview. I also particularly enjoyed her episode because I think she is an incredibly interesting person, with a great philosophy about her which I could listen to all day long. As with these podcasts, if you don’t normally listen to them, it is so important that you listen to the ones with comics you don’t know as well as the ones with people you do. This works to both the comic’s benefit and your’s, by enabling listeners to be introduced to new names. And there are so many new names. Despite these podcasts already working on the basis of paying whatever you want to, whatever you think the show deserves, and whatever you are able to pay: in yet another act of generosity, Richard has decided to release the latest batch of RHLSTP episodes as videos on Youtube, which are normally only available to paying listeners. As a person who can’t afford to pay for these podcasts right now, I feel it is only right to spread the word about these hidden gems of the internet. They’re perfect for long car journeys or to fill time when you should be working, and they also teach us a great deal about the secrets of the industry. We even get some gossip, which is always a plus in my book. You can, and should, listen to and download Richard Herring’s Leicester Square Theatre Podcast via his website, or on iTunes. It would also be brilliant if all of you that are able to could pay something towards the running of the show.